A spokesperson for the Sutton Trust, a leading education charity, has told Legal Cheek the profession needs to redouble its efforts to improve social mobility at the bar, after statistics last week revealed that the privately-educated are still overrepresented. The data, released by the Bar Standards Board (BSB), showed that 12% of barristers attended a UK independent school, compared to 7% doing the same across the UK population. However, this figure must be taken with a pinch (or a bucketful) of salt because the response rate to this question was just 37%, meaning the percentage of privately-educated barristers is likely to be higher. As Conor Ryan, the director of research at the Sutton Trust, notes, the data shows not only that state school students are underrepresented among top QCs, but also “seriously underrepresented among pupils and practising barristers too”. Again bearing in mind the very low response rate, 18% of barrister pupils attended a private school, as did 12% of practising barristers and 12% of QCs. 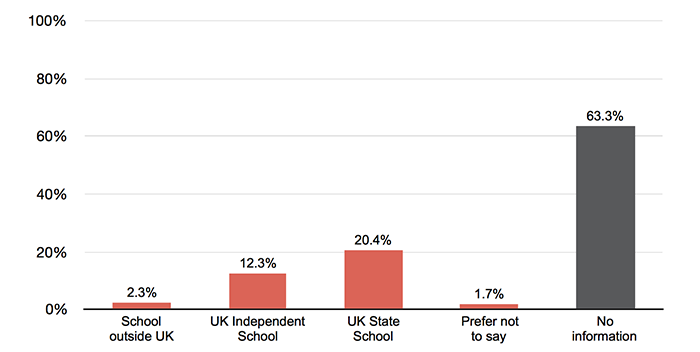 However, if you look not at the total number of barristers surveyed but the total number of barristers that provided an answer, the percentages of private school-attendance are as follows: 27% of pupils, 32% of practising barristers and 34% of QCs. The statistics are stark, but there have been “improvements within the wider legal profession”, Ryan tells Legal Cheek. These include firms’ support of programmes like PRIME (a diversity access scheme supported by the Sutton Trust which helps underprivileged state school children gain work experience at top City firms) and the Pathways to Law programme (run by the Sutton Trust and supports Year 12 and 13 students who are interested in pursuing higher education and a legal career). The cost of barrister training is a particularly large barrier for people from low and moderate-income homes to overcome. 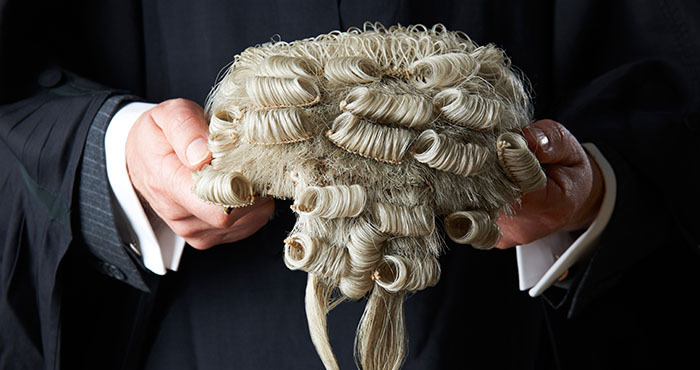 Legal Cheek‘s The BPTC Most List shows postgraduate barrister education can set you back close to £20,000 in London, and more than £15,000 outside of the capital. The cost and structure of barrister training is something the BSB will be considering in its Future Bar Training Programme, which may well see the Bar Professional Training Course (BPTC) split into two parts. In what’s perhaps good news for lie in-loving students, law school may only be compulsory for the second of the two parts. Let’s just rename the site “Diversity Cheek” and have done with it. The reason I skip the article and jump straight to the comments is for posts like this! Are you a vaguely posh white male by any chance? The Bar thinks it’s the recruitment ground for some kind of privately educated Oxbridge master race which is born to rule. Absolutely ridiculous as most barristers would have difficulty getting anything done if it weren’t for the proletarian clerks that take care of them. Speaking as a state educated non-Oxbridge RG graduate, I am concerned that there seems to be a tacit acceptance that the standard must be lowered in order to foster social mobility. Private schools (of the sort I did not attend and cannot afford for my own offspring) generally demand very high standards and teach accordingly. It is therefore no surprise that the ranks of the Bar are dominated thus. Abolishing private schools would not help raise standards. My pie in the sky proposal would be for the state to take over funding them at their current rates, for the schools to have the complete autonomy vis a vis teaching and curriculum that they have now, but make entry selective by ability. That would increase genuine social mobility without compromising standards. Abolishing private schools would benefit the whole society. Look at Norway. All schools are public and they are all excellent. You, as a working-class parent do not have to re-locate in order to send your child to a good school, because you know that your local school will provide your child with an excellent education. Oh and by the way. I know several people who went to Eton and believe me, they were not the brightest. I’m not going to into detail on how they got in. what rubbish. Eden was a great foreign secretary during WW2 and Suez an unfortunate epitaph. Had it been Panama Eisenhower would have done the same. spot on. or at the very least means test free state education. Yes. It’s mad that the state pays for everyone’s education, regardless of their financial position. If it were means tested, taxes would go down and the pressure on the state sector would be less burdensome. It would also mean that selfish parents, who would rather consign their kids to the dustbin of the local comp or whatever, so that they can have foreign holidays, would be forced to put their children first, to the betterment of society. How so? It’s a non sequitur to suggest that abolishing private schools would mean that state schools would be excellent. What evidence do you have that would support this view? I would suggest that the likelihood would be the absolute opposite. I am fortunate enough to be able to just about pay for private school fees. That’s £12,000 out of taxed income. My children do not take the places at a state school for which I have already paid through general taxation. If you abolish private schools, the Government’s tax take will drop, and pressure on school places will presumably increase by 7%. Government shows no appetite for significantly adding to the Education budget, so I imagine the result will be larger class sizes all around. Of course, I will benefit from being able to afford to go on holiday again, but I will still give my kids an advantage by paying for private tutoring – or moving to an area with better state school. If you really want to abolish private schools the way to do so is to make state schools better than private schools so it would become irrational to pay for education. Not going to happen though, is it? Your offspring? Talk like a regular person please, then maybe people would take you seriously. Jesus. And implicit in your position is that privately educated children are more meritorious. The evidence is to the contrary. State schooled children outperform their privately educated counterparts at university. However, because one can be spoon fed a curriculum until 18 years of age: more privately educated children attend Oxbridge. A 2:1 from Oxbridge, with their tutoring system (great practice for interviews), I believe puts candidates at an advantage over many state schooled children who go on to achieve a 1:1 from a non-Oxbridge university. Maintaining private schools with merit-based selection? Why do we think that those with the means won’t pay for private tuition before the (equivalent to eleven-plus) exam? Pie in the sky would be far more equality at the root of society. I think the idea that increased social mobility would mean lowering standards is incorrect. The idea that there are not enough state school educated candidates capable of attaining the same standards of excellence as their privately educated counterparts is nonsense. State schooled students do better than privately educated students at all universities, on average, including Oxbridge. The difference is often the expectations they have of themselves, confidence and the soft attributes that allow them to seem like the right sort of chap who would fit into chambers life. These things are all capable of being addressed without lowering professional standards. The one thing a public school education and a career at the bar have in common is getting buggered by those in positions of power over you. That is a significant benefit. In fairness, for balance you should also mention that there are some disadvantages to a public school education/the Bar as well. You can hardly blame an employer for preferring a privately educated person over one educated at a state school. A privately educated individual is far better educated and will be confident, polished and comfortable in his own skin. State schools provide a truly awful education and send people into society woefully ill prepared for life who are gauche and resentful. Rather than criticising employers for making a rational decision, and calling for the abolition of private schools (which will never happen), such people should campaign for the Government to improve standards in the state system or emigrate to a country such as Sweden, which does not have a two tier system and where their inadequacies will not be as obvious. Isn’t the answer much easier, only privately educated, Oxbridge monkeys can be bothered going into the law. Most of my privately educated lawyer friends (barristers and solicitors) hate their lives and their work, do we really want to inflict the same gray, stressful, unfulfilling tedium on intelligent state school people? If it’s a day ending in a “y”, it must be time for another Bar-flagellating piece about the Bar being dominated by those who attended a private school. Is there any other profession so obsessed with this issue? I doubt it – out in the wider world, the old system of unpaid pupillages, long gone at the Bar, is more widely used than ever before, with graduates often having to endure a couple of years of unpaid internships before landing a paying job. As Porcus Porcus points out, the situation is not surprising, given that what LC would inevitably call “top” schools focus relentlessly on academic results and the Bar’s recruitment is also relentlessly oriented on academic results. The figure of 32% of practising barristers having attended a private school is, in the circumstances, surprisingly low. LC recently ran a piece that analysed the universities attended by those starting at the Bar, with Cambridge dominating. What percentage of Cambridge Firsts and Firsts from other leading Universities attended a private school? Probably more than 32%. Meddle like this, and the “top” sets will take on an increasing number of more mature lawyers who have already qualified in other jurisdictions, or solicitors from UK who are moving to the Bar. That is probably an improvement on the current set up. Should 25 year olds really be getting up in court and representing vulnerable clients? It’s already happening. People become solicitors and then move over the Bar. That is what you call mobility- the long way round! I may not have gone to the bestest school, but is that a non sequitur? All going to public school taught me was how (not) to cope with being bullied relentlessly for wetting my bed. I now have a nappy fetish and seek out call girls to dress up as matron and spank me for being a bad boy. Totally confident, balanced and polished. It is very frustrating, reading constantly that the cost of training is stopping those entering the profession. This is absurd- I am from a working class family who were not able to pay my tuition fees. As this was my chosen path I felt if I wanted it then I will find a way and I did through a bank loan. The issue is pupillage, there is simply not enough of them. How can a person stand out if the chambers’ criteria favours for example a unique internship abroad, when your ‘disadvantaged’ person has managed to secure funding just for the course. I blame sets for not appreciating this issue but instead they should also focus on what people have overcome in their lives. Chambers need to look at their shortlisting criteria! Social mobility needs to be tackled from all aspects not from individuals who just look at statistics. This has been an ongoing issue why can’t there just be some action taken to address it instead of having a lengthy debate? One of the further issues is once at the Bar, solicitors tend to instruct barristers who resemble their own image and background. Chambers bear a huge responsibility but they are not totally to blame, their needs to be a culture change in the way solicitors think about who they instruct and why they instruct them. Just looking at barrister profiles on websites, those chambers whose make up is non Oxbridge is slowly moving towards favouring Oxbridge candidates. It will be an Oxbridge dominated profession once again. Of course. Because Oxbridge candidates are the brightest. Bring back unpaid pupillages- what is another £12,000 on top of LLB and BPTC costs. I would happily take out another loan if it means I can qualify. Just to clarify- I fall into the state school, working class group. BSB needs to re think its position or would they prefer it if I completed pupillage abroad and return to England and obtain a waiver?? ?